This title was first published in 2001. 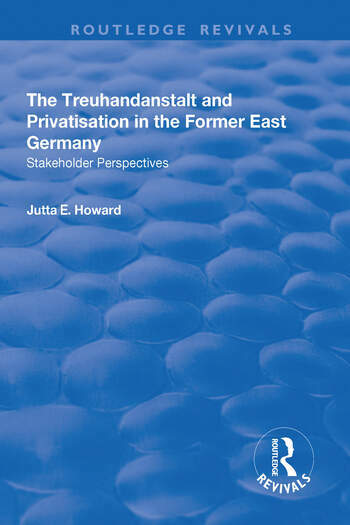 This study explores the operation of the Treuhandanstalt, the trust agency responsible for implementing the massive privatization programme launched in the former East Germany in 1990. It evaluates the level of satisfaction that stakeholder groups typically felt with regard to the agency, its actions and its achievements. Contents: Introduction; The Treuhandanstalt and the privatization process; The Treuhandanstalt, stakeholders and organizational effectiveness; Buying into the former East Germany: motives, experiences and lessons of the privatization process; Employees and management as stakeholders: learning and management in an era of extreme uncertainty; Environmental turbulence and the management of public perceptions; The inheritance and prospects of the successor organizations; Conclusion: legacy and evaluation; Appendices; Bibliography; Index. Jutta Howard earned her Ph.D. from the School of Management at Royal Holloway, University of London. UK. She has been teaching courses in management, marketing and international business in Southern California.